The Thork-Lift – quality in working height! 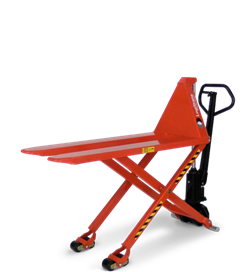 The highlifter, Thork-Lift, can transport and lift a skid to the right ergonomic working height, and is very gentle to surroundings, skids and goods. The Thork-Lift has an elegant design with rounded corners. The design of the highlifter prevents industrial injuries and strain on the user – focus is put on safety and ergonomic working conditions of the user. As an example, the ergonomically correct shape of the handle ensures a relaxed hold for the user. Loads of 3300 lbs. to 18.5 inches. From 18.5 inches the lifting capacity is 2200 lbs. Focus on optimum hygiene – the stainless Thork-Lift is developed for the use in environments with high hygiene demands. This is done in close cooperation with customers in industries where the trucks are exposed to an aggressive environment and thorough cleaning. With a stainless Thork-Lift the risk of bacterial contamination is minimized. High flexibility and efficiency – one product can transport and lift a pallet to the right working height. The design of the highlifter prevents industrial injuries and strain on the user – focus is put on safety and ergonomics. Optimum hygiene – with a stainless Thork-Lift the risk of bacterial contamination is minimized. The stainless-semi products are developed for environments where severe hygiene is needed on the surfaces that are in direct contact with the goods being handled, e.g. meat, fish or medicine. Stainless fork chassis, handle, axles and wheel holder. All other parts have a polymer plastic coating or are chromit-treated. Stainless fork chassis, handle, axles and wheel holder. All other parts have a polymer plastic coating or are chromit-treated. Battery indicator extra painted.